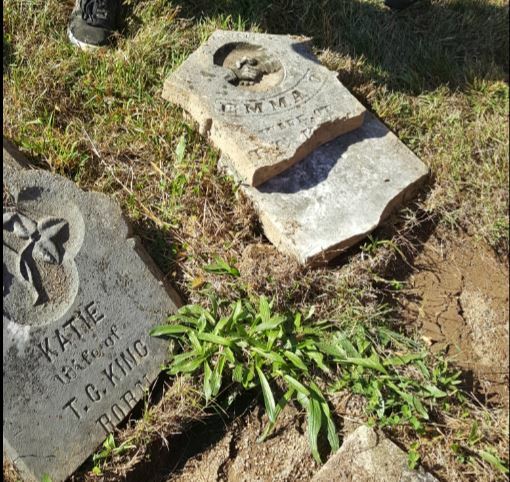 Several cemeteries in Trimble need attention. Corn Creek was chosen as the first project for a few reasons. 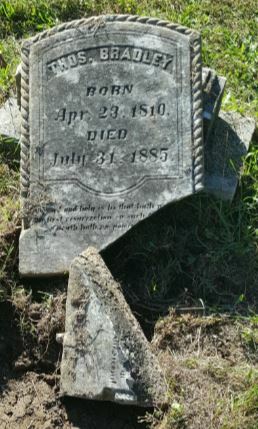 One, it is one of the oldest cemeteries in the county. 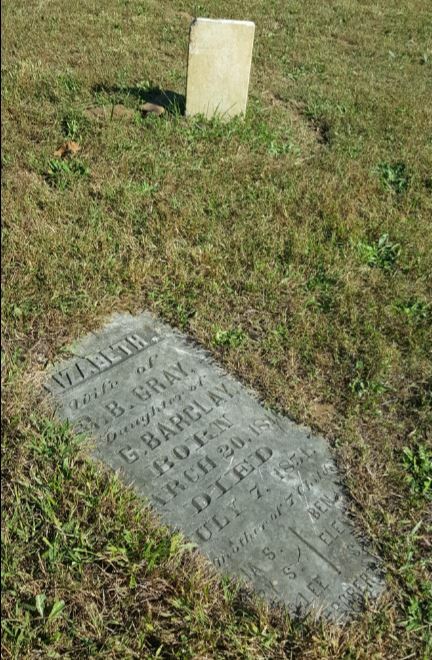 Two, given the age of the markers in the cemetery there is historical significance in the gravestones themselves. Three, nature and time add to the already present erosion issues in the region. Some stones require cleaning; others need repair. Then, other stones are sinking and need recovered and reset. 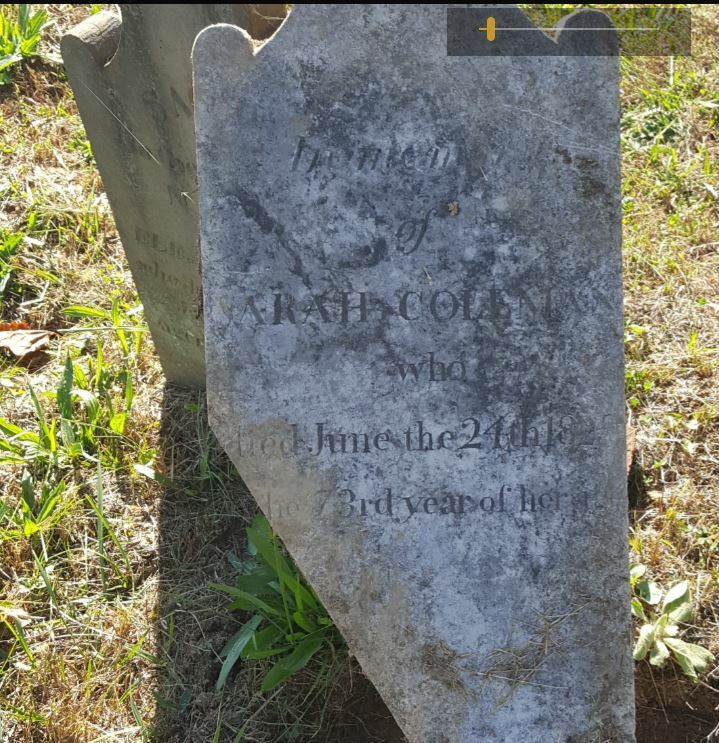 Corn Creek Baptist Church Cemetery. 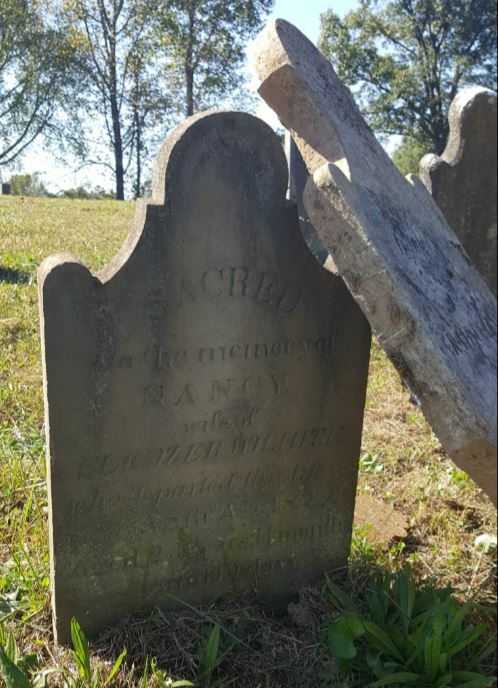 Photo courtesy of Tina Mitchell Boutall for the Trimble County Historical Society of Kentucky. 14 Oct 2017. 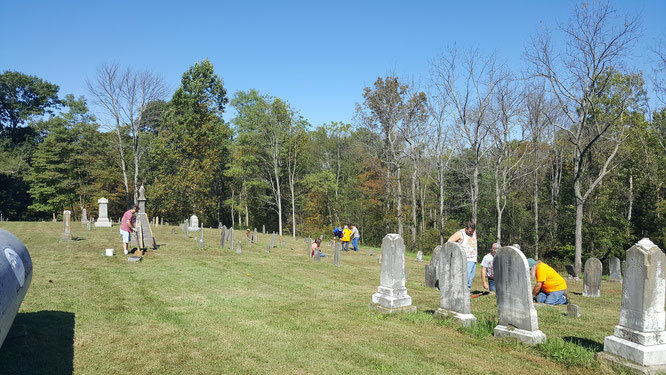 Members of the Cemetery Club met at Corn Creek Baptist Church on Saturday, October 14, 2017 for fall cleanup and gravestone maintenance. A few club members were wearing their new shirts bearing the slogan We Dig History across the front. Shirts were also distributed to the Trimble County Middle School History Club by Hilda Parrish. The History Club is invited to share in our preservation efforts at Corn Creek and other locations. 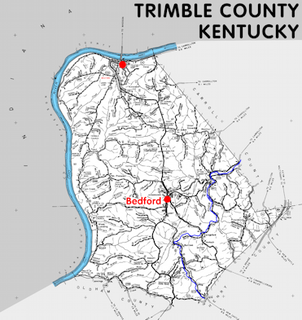 The Trimble Co. 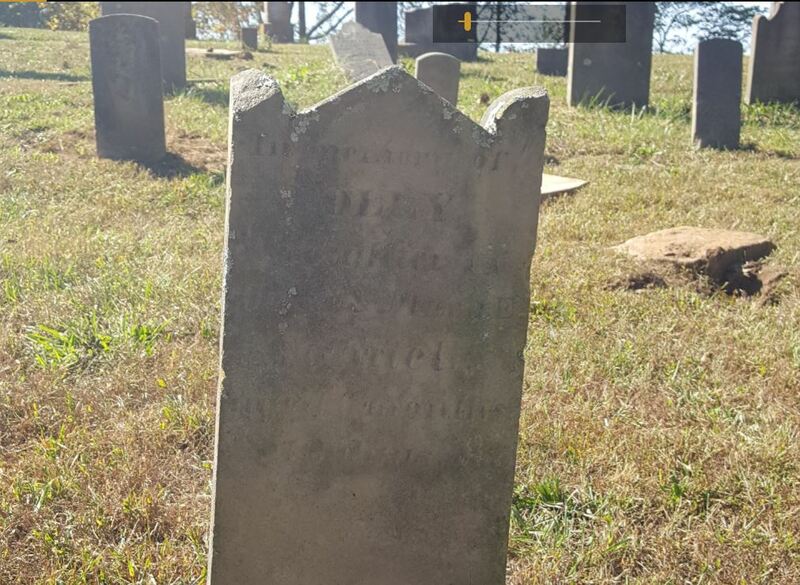 Historical Society Cemetery Club Working at Corn Creek Baptist Church. 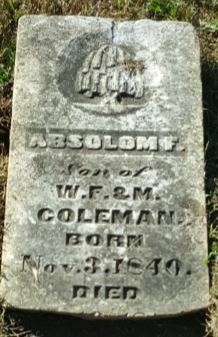 Photo courtesy of Tina Mitchell Boutall for the Trimble County Historical Society of Kentucky. 14 Oct 2017. 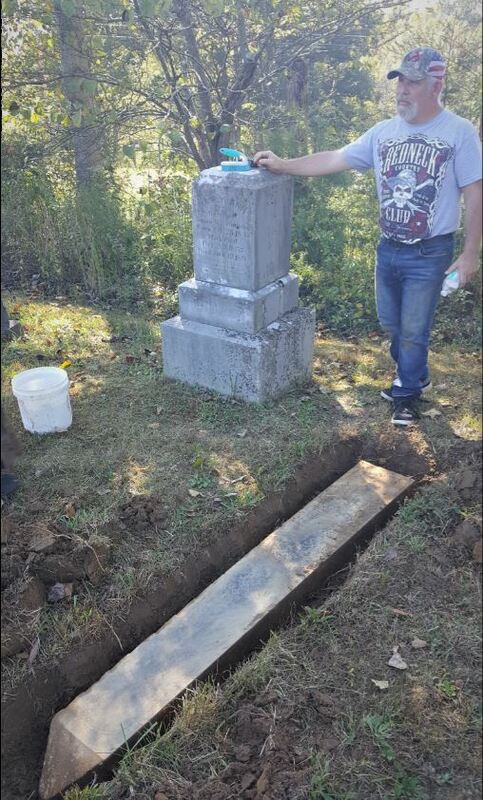 The Corn Creek Cemetery Trustee, Troy Helton (pictured above), is working to bring sinking stones to the surface for families. 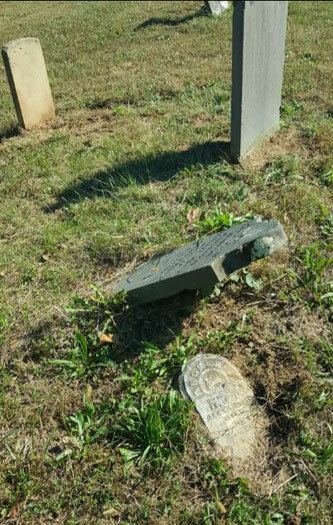 As gravestone maintenance requires the consent of living descendants, it is important to contact us should you relate to anyone with a stone at risk in the Corn Creek Baptist Church Cemetery. 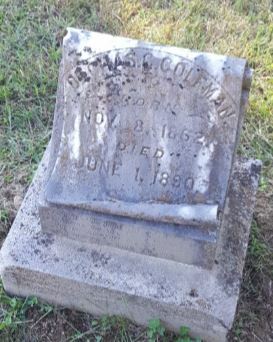 The Cemetery Club of the Trimble County Historical Society is happy to help Troy Helton with maintenance at Corn Creek. Thanks to everyone who volunteered last weekend! Walking and photographing several stones at varying stages of risk, I wish to stress to everyone – things happen. Time takes its toll. 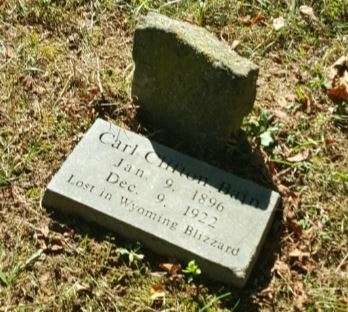 The issues arising at Corn Creek occur in many cemeteries over time. 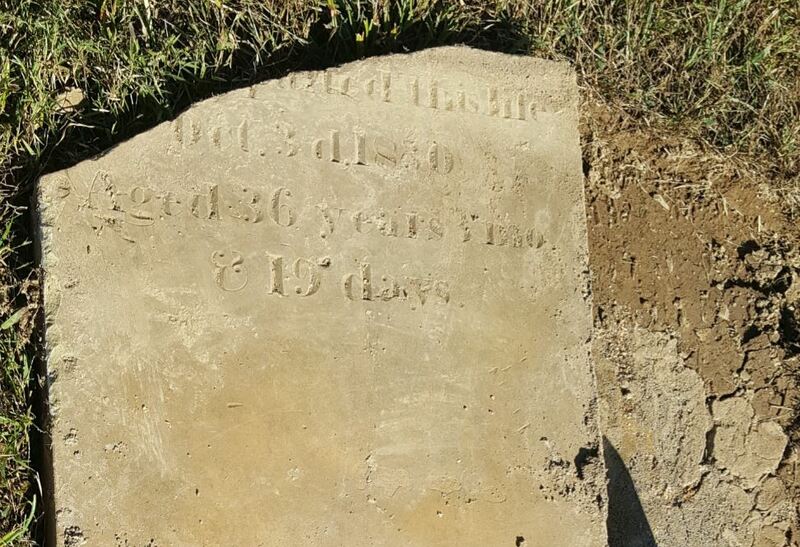 Corn Creek is peculiar because the graves are actually sinking. The mix of clay and loam there coupled with groundwater issues creates a suckering effect; grabbing the stones and taking them lower each year. 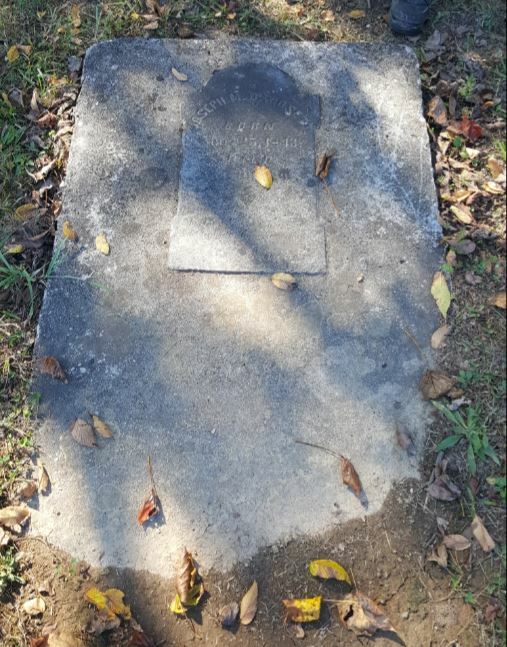 Graves visible twenty years ago are now one to two feet lower. I found one small marker there with only three inches left showing. 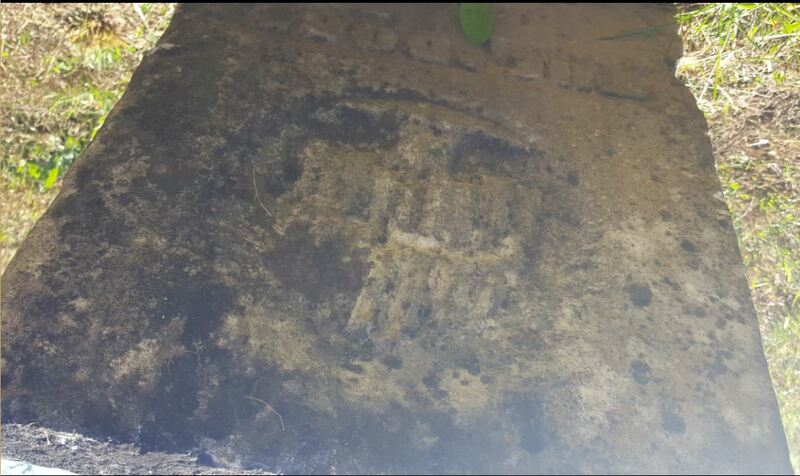 The only indication of who might be resting there was the inscription of MOTHER engraved on the stone’s arch. 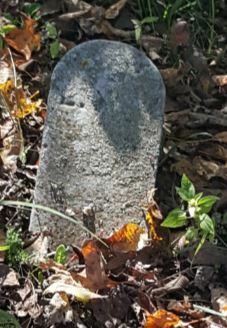 It will be necessary to bring the stone to ground level to read the marker. 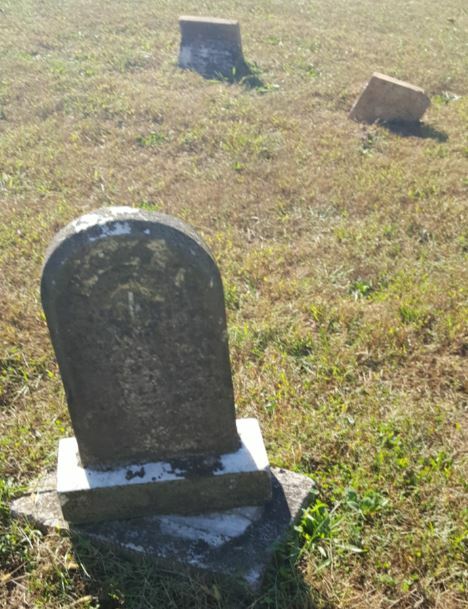 Volunteers are in need of a plot map to identify interments before a full maintenance plan is implemented. 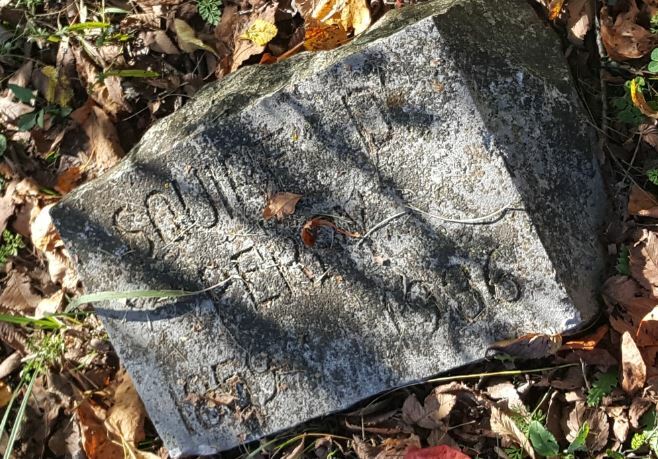 Sunken stones may be identified using a plot map. 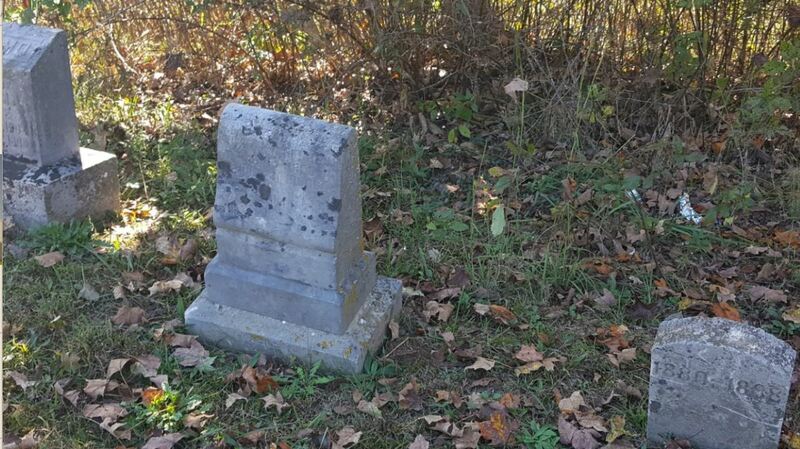 To date, we find no plot map for the Corn Creek Cemetery on file. 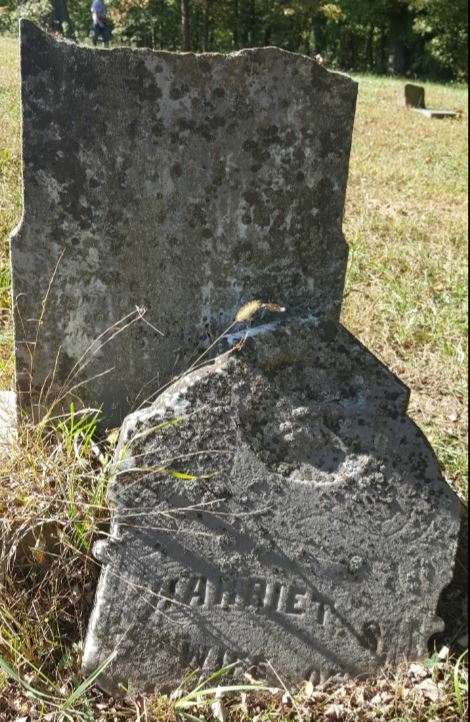 The stone on the right bears the inscription MOTHER on the arch. 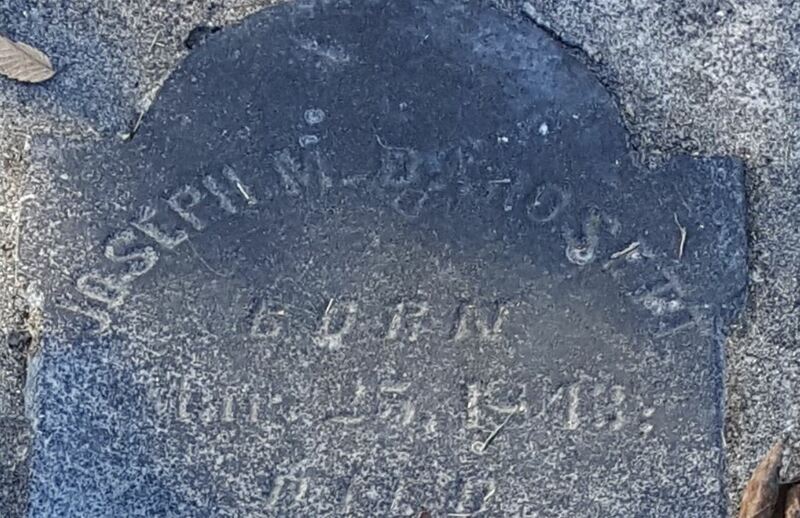 Compared to its neighbor, the rest of the stone is 12 to 18 inches underground covering the name of the deceased. Photo courtesy of Tina Mitchell Boutall. 14 Oct 2017. The group plans to return Saturday, October 21, 2017 after the Trimble County Historical Society Meeting at 10:30 a.m. The meeting adjourns at 12:30 p.m. 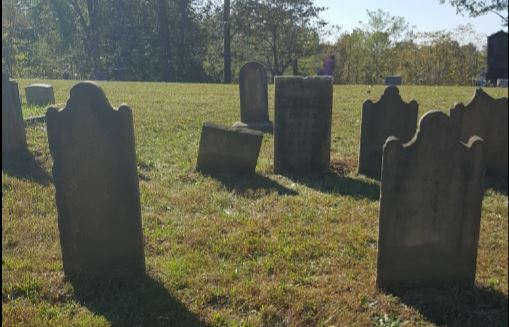 The Cemetery Club will proceed from the Trimble County Public Library to the Corn Creek meeting house about 1:00 p.m. to clean and repair stones. Contact the Cemetery Club if you wish to join them that afternoon. 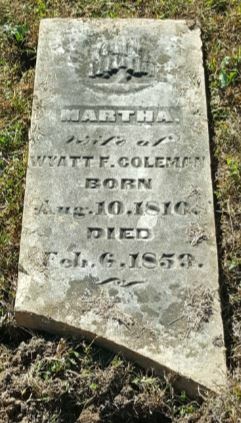 Weathering obliterates the inscription on this stone near the monument for Mary Gossom. 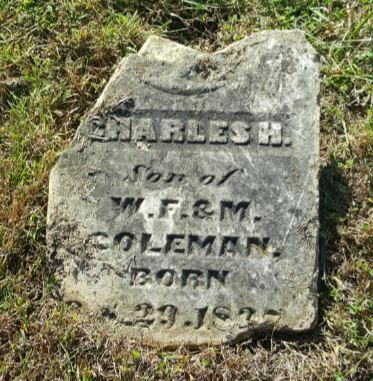 Corn Creek Baptist Church Cemetery. 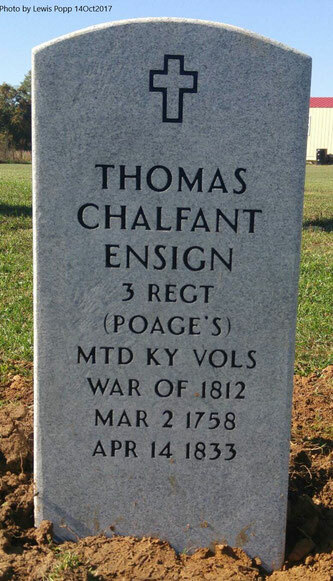 Photo courtesy of Tina Mitchell Boutall for the Trimble County Historical Society of Kentucky. 14 Oct 2017. With everything, a cost is associated. 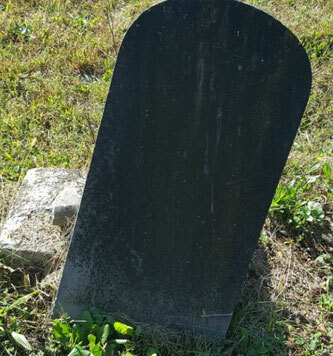 The D2 Biological Solution approved for use on gravestones is the same solution used to keep the White House in impeccable condition. Special epoxy used to mend broken markers is needed. Expertise is also required for repairs. The Gravestone Guardians provide examples of responsible maintenance versus irreparable damage here. 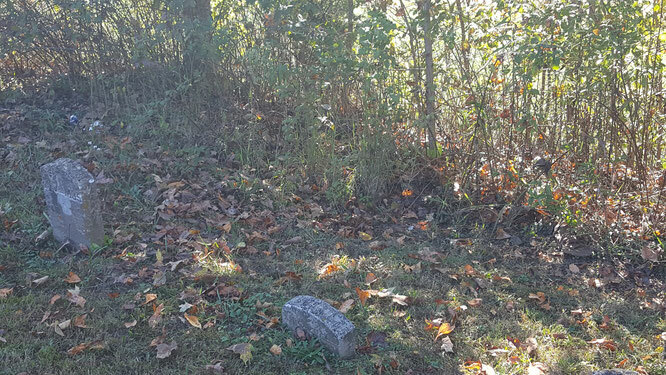 Some families have already come forward with donations whose ancestors are buried at Corn Creek. More donations are needed to complete the project in a timely manner. 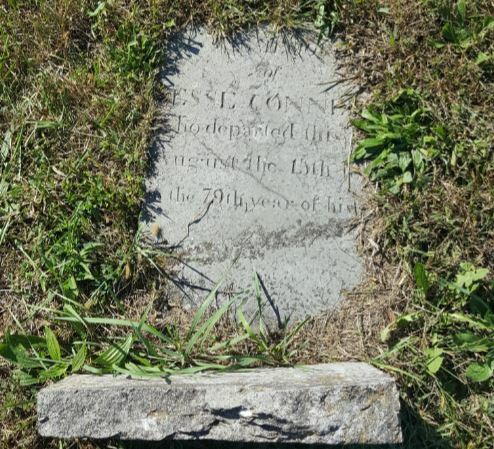 When it comes to cemetery preservation, time is one thing that works against the historian. The elements have their say and take their toll. See the Basic Monument Cleaning Booklet from the National Park Service. 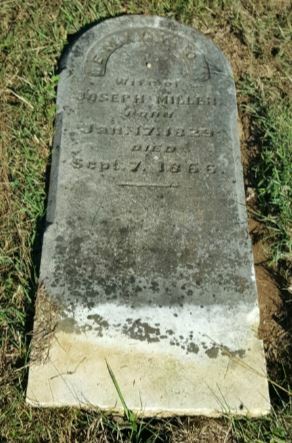 With proper care, a monument can last up to 100 additional years. 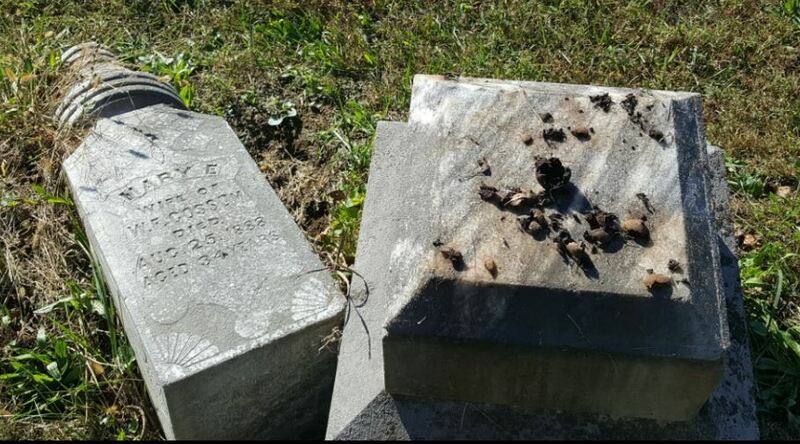 The new biologically friendly D2 cleaner allows the Cemetery Club members to bring the stone back to its original color. The epoxy is for repairing broken markers and monuments. It is capable of repairing monuments up to 2000 pounds in weight. 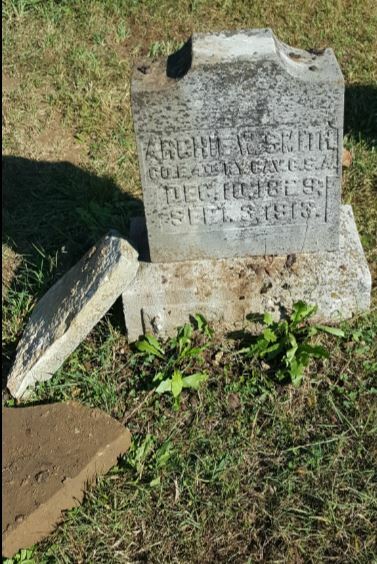 According to the statutes within the state of Kentucky, a church like Corn Creek tends the ground itself where loved ones were lain to rest. 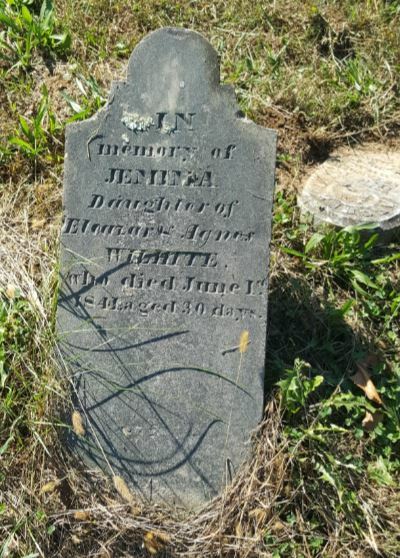 The maintenance of the marker itself, however, is the family’s responsibility. 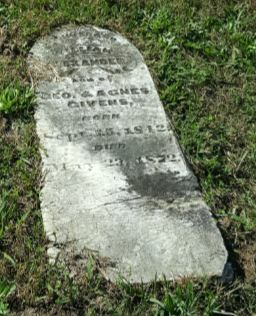 Many who sleep in the church yard may no longer have local descendants. 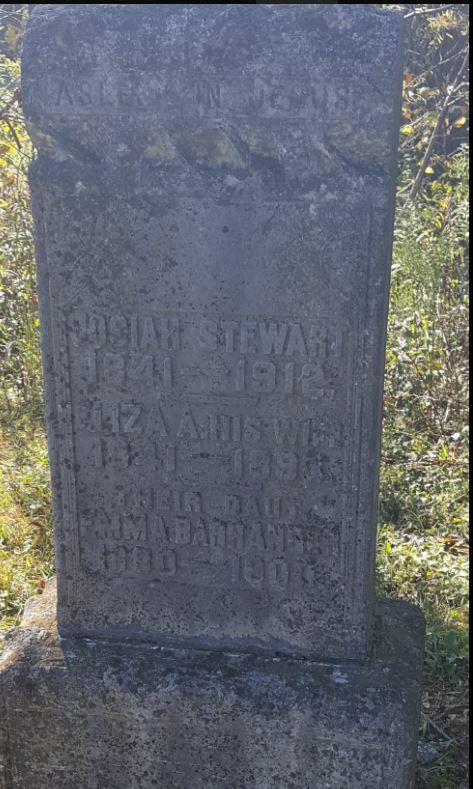 We also realize those who moved away are unaware of what is happening to the graves of their ancestors. 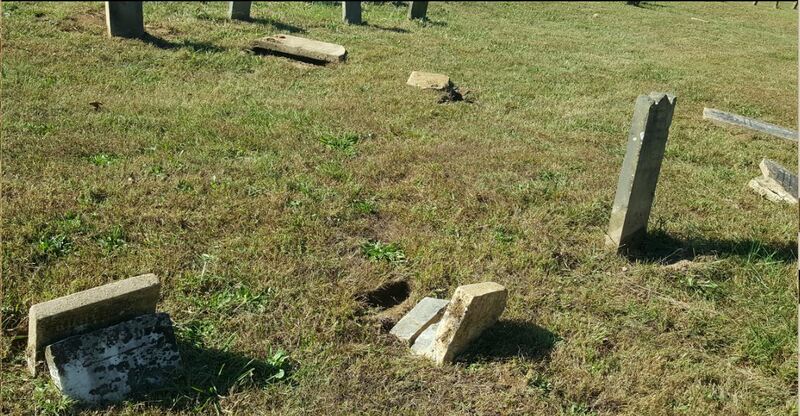 The stones at Corn Creek Baptist Church need some love. The Cemetery Club needs donations, helping hands, and any time folks may have to complete the project. 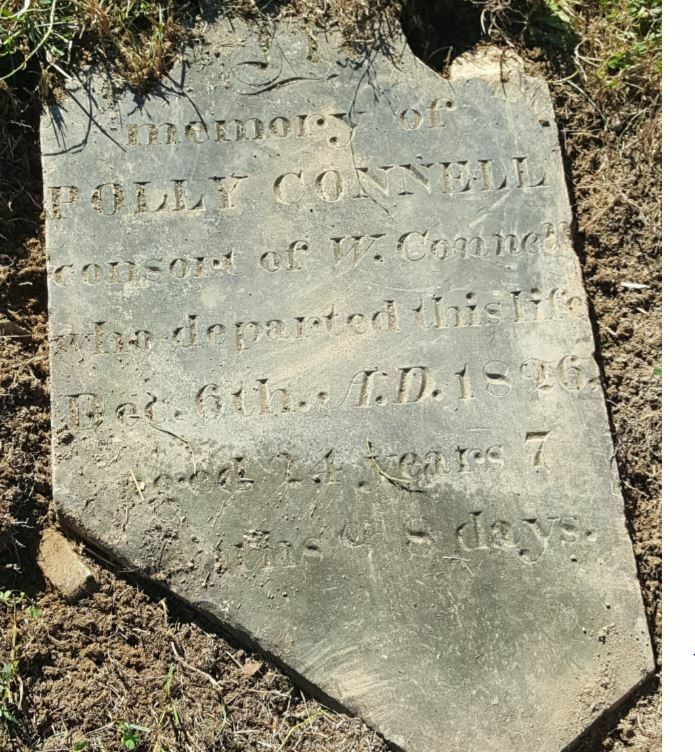 If we expect the cemetery to tell its story for years to come, remediation work is needed to prevent the stones at Corn Creek from disappearing forever. 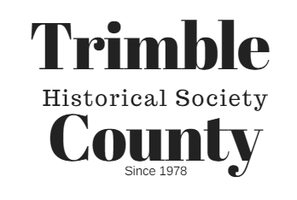 are accepted by the Trimble County Historical Society. 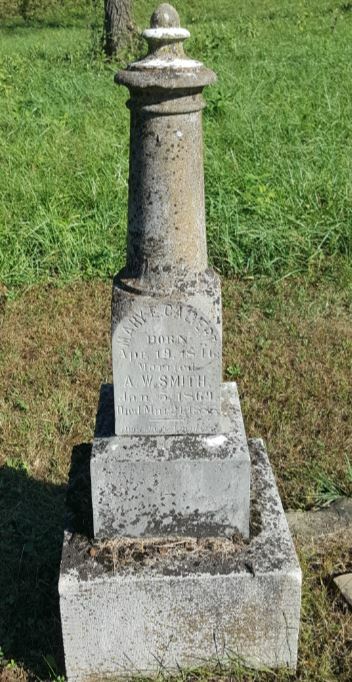 stone receiving donations for maintenance. 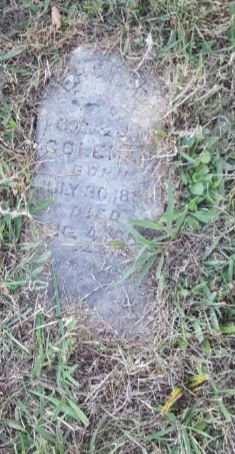 *This grave is currently unmarked. If you have a military veteran in your family line who does not have a military marker, please let us know. Markers can be ordered from the Veterans Administration for your loved ones.